Abel Parker Upshur was appointed ad interim Secretary of State by President John Tyler on June 24, 1843. On July 24, 1843, Tyler appointed Upshur Secretary of State, and he entered duty on the same day. His term ended on February 28, 1844, the day he died. Upshur was born the son of a planter family in Northampton County, Virginia. He attended Yale College and the College of New Jersey (now Princeton University) for one year before returning to Virginia to study the law. Upshur gained admission to the Virginia bar in 1810 and practiced in Richmond. He began his political career shortly after, serving as a member of the Virginia House of Delegates from 1812 to 1813, with a second stint from 1825 to 1827. He was appointed as a justice to the Virginia General Court in 1826, and continued to serve in this capacity until 1841. In 1829, Upshur served as a delegate to the Virginia Constitutional Convention. President Tyler appointed Upshur as Secretary of the Navy in 1841. He served as head of the Department of the Navy until June of 1843 when he was appointed ad interim Secretary of State one month before becoming Secretary of State. Although appointed in June, the Senate did not confirm Upshur until January of the following year. Upshur served briefly as Secretary of State until his untimely death in February of 1844. Aboard the battleship, Princeton, on the Potomac River in Washington, DC, he was killed by the firing and accidental explosion of one of the ship’s guns. As Secretary of the Navy, Upshur believed in the vital role the Department played in securing the nation’s interests. He worked to expand the Navy, outfit it with modernized warships and reform its administration. His tenure there provided him the necessary foreign policy experience to make the transition to the Department of State in 1843 at the request of President Tyler, a lifelong friend. Tyler implored a hesitant Upshur to take the position, appealing to his interest in expanding the nation westward. 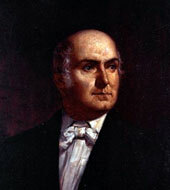 As Secretary of State, Upshur’s diplomacy set in motion territorial expansion that did not come to fruition until after his death. He single-mindedly pursued this goal and reopened negotiations for the eventual Annexation of Texas in 1845. Pro-slavery and wary of British influence in the Southwest, like President Tyler, Upshur believed it was in the United States’ best interest to annex Texas as a slave-holding state. He also worked to settle a prolonged border dispute with Great Britain over the Oregon Territory, resulting in the Oregon Treaty of 1846. Commissioned during a recess of the Senate; recommissioned after confirmation on Jan 2, 1844.